you who are the father of letters, from a paternal love of your own children have been led to attribute to them a quality which they cannot have; for this discovery of yours will create forgetfulness in the learners' souls, because they will not use their memories; they will trust to the external written characters and not remember of themselves. The specific which you have discovered is an aid not to memory, but to reminiscence, and you give your disciples not truth, but only the semblance of truth; they will be hearers of many things and will have learned nothing; they will appear to be omniscient and will generally know nothing; they will be tiresome company, having the show of wisdom without the reality. Indeed, today written language has precedence over orally preserved language. Although recent archeology has uncovered in China carved signs similar to writing which may date to 8,600 years ago, conventional wisdom holds that the first writing, cuneiform, appeared in Sumer in Mesopotamia around 5,000 years ago. 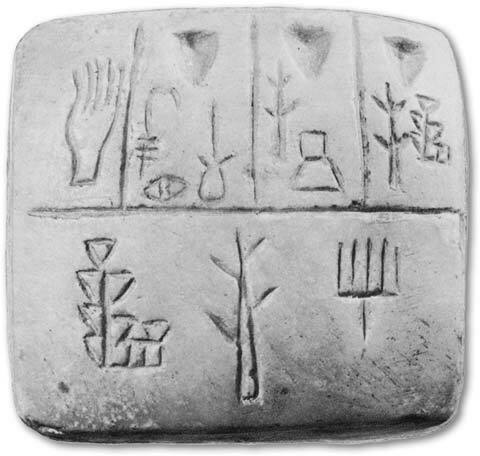 Some scholars, however, believe cuneiform was developed from an earlier counting system in use 10,000 years ago, recorded with etched symbols on clay tokens. Like modern Japanese or Chinese scripts, all currently known early written languages used pictograms and symbols. Later the quicker-to-learn alphabet system developed whereby individual sounds are represented by symbols strung together to form words. The last 500 years have seen an explosion in the way ideas are communicated. The ability to record and transmit written language on a grand scale emerged with the European use of the printing press during the 1450s, and since then literacy has spread worldwide, empowering millions to communicate their thoughts more widely. The past hundred or so years has seen the invention of the telephone, radio, television, typewriters, word processors, faxes, satellites, email, the internet, computer video-conferencing, and the human voice recorded on wax cylinder, records, tapes, compact discs, and computer drives. Mobile phones enable voice-contact with others almost any time, anywhere. Words play a vital role in today's global psychological battlefield. In those modern influencers of mass opinion -- news, entertainment, and advertising especially -- they are used with ever more contrivance and persuasiveness, resulting in a greater challenge for us to determine how accurately the world around us and our place in it is being described. However, there are also many writers, broadcasters, and musicians using the language of the heart, inspiring many with visions and ideas of truth, beauty, hope, and optimism. Movements and programs promote ethics in this area, such as the American campaign "Words Can Heal" which aims to "eliminate verbal violence, curb gossip and promote the healing power of words to enhance relationships at every level"; the extensive research in psychology and sociology into the positive and negative effects of speech on the speaker and hearer; and courses in speech ethics. In the West speech also takes a backseat to writing with regard to preserving ritual and prayer. Not so with some indigenous peoples. For example, some Native American tribal leaders have been reluctant to allow written versions of their languages to exist. To maintain purity and sacredness, shamanistic teachings are never written down. The details and nuances of some natural healing methods have also been lost when oral instructions were written down. There has perhaps, then, never been a more critical time for us to understand what we really have in the power of speech and language and the ethical responsibilities that come with that power. The story of what our speech is, its evolution, and how we can use it, is truly magnificent. H. P. Blavatsky expresses it mythically in The Secret Doctrine: as the gods or intelligent forces in nature awakened from an ages-long sleep, they began to form around them the material universe until they had expressed themselves in their relative fullness. First to arise was the desire to express latent possibilities and urges, and the bringing to rebirth by karma of long-dormant causes. The shockwaves of this initial cosmic event are still vibrating in every atom. The desire to express inner thoughts, forces, motivations, and ideas is constant throughout nature, as we can see in the perpetual destruction and regeneration of all things. Mankind is no exception to this universal law, since we are continually expressing our inner desires through our thoughts and actions. One way we express our thoughts is through speech. Speech and language are implicit in our humanity, natural emanations from our innermost being. The Secret Doctrine marks the importance of spoken language by saying that it developed during the turning point in our evolution, anywhere between ten to fifteen million years ago (2:198). According to theosophy the earliest human beings were speechless, using a type of "thought-transference," with no method or need to express thought physically. Over millions of years a language of vowel-like sounds akin to chanting evolved, later including onomatopoeic sounds from nature such as clicks, snaps, pops, and animal and plant noises. Eventually monosyllabic speech -- vowel sounds broken by consonants -- developed, as self-aware mind emerged along with the power of reasoning. This spawned the birth of language as we know it, and speech moved through cycles of growth including agglutinative languages, in which word elements are strung together without changing each other, and inflectional languages, in which word elements may change form according to their grammatical function. The pattern here is that everything flows and is governed from within, and our speech is intertwined with the creative forces of the universe. The more refined and developed human self-consciousness becomes, the more refined our language and speech may become, or we may move away from verbal communication altogether and rely more on psychic and spiritual methods, the seeds of which are germinating now. The world currently has about 6,000 to 7,000 languages. As to their ultimate origin, opinion is divided between those who assert that language and speech are instinctive abilities and those who believe that linguistic evolution follows the Darwinian model of natural selection. Because the sound of a word has no direct connection to its meaning, words change meaning and form so quickly that many linguists argue that their origins are virtually untraceable, lost in history. The linguist most celebrated for work on the historical relationship between all the world's languages, Dr. Joseph H. Greenberg, disagrees. He states that the meanings and sounds of certain language items are more stable than others: personal pronouns, parts of the body, and natural objects such as the sun and moon. By comparing hundreds of stable, core words he constructed a grouping of twelve super-families, such as Eurasiatic and Amerind, which may have been in development for at least 60,000 years. Russian linguists Illich-Svitych and Dolgopolsky derived independently a controversial Eurasiatic super-family called Nostratic, which they believe was spoken more than 12,000 years ago. Nostratic overlaps Greenberg's Eurasiatic and includes some Middle-Eastern and Afro-Asiatic languages but not Eurasiatic's Japanese and Eskimo-Aleut languages. Derek Bickerton contends, in opposition to the notion that primitive language may have arisen out of the basic need to communicate, that speech and language manifested as the mind strove to comprehend the world around it. His theory is underpinned by the idea that the stages of development a human being progresses through from conception to adulthood may parallel mankind's evolutionary stages. Archeological research into population genetics is used to support many historical linguists' theories. Comparisons of mitochondrial DNA from ancient cadavers in various parts of the world, and cross-references of today's language similarities such as grammar and syntax, reveals a picture of human migratory routes spanning millennia and the origins and development of certain languages. How far back this process can take us is debatable. Merritt Ruhlen makes the controversial case for a global language called Proto-Global, suggesting that today's languages might be descendants of a single ancestral human language with roots hundreds of thousands of years old. This ties in with some DNA studies* which assert that all peoples, and perhaps all languages, are descended from a tiny African population some 200,000 years ago -- the " 'Eve' out of Africa" theory. Many scholars are now engaged in a multi-disciplinary endeavor called the "Emerging Synthesis" which aims to unite research in linguistics, human genetics, and archeology to form a single hypothesis concerning the origin and spread of modern humans from Africa to the rest of the world over the last 100,000 years. In contrast to the single ancestral language theory is the idea that there are multiple ancestral languages which may have developed independently of each other on different parts of the globe during different phases of human evolution which together spawned the diversity we see today. * For a discussion of different models of human descent, see "The Quest for Human Origins" by Ina Belderis, Sunrise, April/May 2003. Some projections show the likelihood that between 3,500 to 5,500 languages will become extinct in the next hundred years due to such factors as population displacement, merging cultures, land destruction, government policies, migration, disease, globalization, and electronic media. There were once many more languages; Spanish and Portuguese, for example, now dominate in South America at the expense of hundreds of indigenous languages. Now half the world's population speaks only fifteen languages and half the world's languages are spoken by groups of no more than 2,000 to 3,000 people. We may feel that having many languages in the world enriches our ability to express ourselves and allows us to perceive the world and others through concepts different from our own. The Sanskrit word karma, for example, virtually unheard of 150 years ago in the West, encompasses meanings and concepts with no European single-word equivalent. Is it not also important to preserve the folklore, mythology, and history of a people to give some kind of cultural and spiritual context to their lives? Attempts are being made to save and revive languages before the only remaining record of them exists in written form or they disappear altogether. Some argue, however, that with more people speaking fewer languages cultural barriers may lessen and encourage the blossoming of much needed understanding between peoples across the globe. Writing in 1888, Blavatsky stated that "there was, during the youth of mankind, one language, one knowledge, one universal religion," (SD 1:341). Although The Secret Doctrine refers to a few extremely ancient languages, the oldest that theosophical literature speaks of at length is Senzar, which Blavatsky describes as a secret sacerdotal language: "for there was a time when [it] was known to the Initiates of every nation, when the forefathers of the Toltec understood it as easily as the inhabitants of the lost Atlantis, who inherited it, in their turn, from the sages" going back to the earliest human beings (SD 1:xliii). It remains unknown to modern linguistics, and theosophical literature maintains that it has been unknown to the mass of mankind since global cataclysms caused the divergence of languages from a common tongue, events characterized by flood myths and the biblical allegory of the Tower of Babel. Blavatsky calls it the "direct progenitor" or "root" of Sanskrit, and relates it also to ancient Persian, Japanese, Egyptian hieroglyphics, and Native American languages. Senzar was a means of communicating the most profound esoteric truths. Although it has its own written characters, its essence lies in part beneath the universal pictograms, glyphs, and geometry used in spiritual traditions, and partly in the storytelling devices and archetypes of allegory, parable, and metaphor found in dreams, mythology, folklore, religions, and the arts. All of us can intuit to a degree the meaning implied in such symbols as a circle or cross, the parables of Jesus, or Grimms' fairy tales. We think in symbols and concepts, in a language some linguists call mentalese, so these are perhaps collective memories of spiritual truths we all once understood that lie still within us, truths buried under many lives of habitual materialistic thinking, waiting for us to make the call. In an echo of Plato's teaching that all learning is remembering, Blavatsky implies that mankind will one day restore knowledge of the universal mystery language. the child knows vastly more than experience has provided. That is true even of simple words. Young children acquire words at a rate of about one every waking hour, with extremely limited exposure under highly ambiguous conditions. The words are understood in delicate and intricate ways that are far beyond the reach of any dictionary, and are only beginning to be investigated. When we move beyond single words, the conclusion becomes even more dramatic. Language acquisition seems much like the growth of organs generally; it is something that happens to a child, not that the child does. And while the environment plainly matters, the general course of development and the basic features of what emerges are predetermined by the initial state [Universal Grammar]. But the initial state is a common human possession. It must be, then, that in their essential properties, languages are cast to the same mold. The Martian scientist might reasonably conclude that there is a single human language, with differences only at the margins. -- Ibid. Language acquisition in children is a fiercely contested scientific area: the familiar "nature versus nurture" debate is alive and well here. On the one hand it is generally accepted that babies and young children do acquire individual words and their meanings into their mental dictionaries by learning from their family. However, understanding such complex and subtle qualities as recognizing and responding to individual sounds within a word, generalizing and specializing over categories of meaning (whether "stone" means rock, a particular rock, the verb "to stone," all the qualities of a stone, a mineral, an inanimate object, etc. ), and inference, are, like many innate abilities, little understood. What is missing from the standard insights into language acquisition is the notion that the human body, with its brain, is the vehicle of an inner divinity. In our higher reaches we have an all-encompassing understanding of ourselves and our environment based on countless lifetimes of refinement through reimbodiment on physical, mental, and emotional planes. Our growth from germ through childhood to adulthood is directed by our spiritual self. The human soul or higher mind is itself an emanation of spirit. During physical gestation it attracts around it attributes from previous lives to build the composite spiritual, psychic, and physical human being, a process which stops only towards the end of the natural life-span. The link between spiritual and physical is strong, and we rely more on the spiritual than the physical for governing our biological and psychological processes as well as for developing deeper understanding. The universal theme upon which all languages are based -- written, spoken, sign, Braille, or finger-spelling -- and the innate ability to acquire language with all its subtle, complex qualities may exist within and operate through a nonphysical medium. One possibility is biologist Rupert Sheldrake's morphic field theory: that fields of intelligent energy, "an inherent memory in nature," are used to record and transmit mental, behavioral, social, and cultural ideas from one generation to another, a process Sheldrake calls morphic resonance. This idea relates to the archetypes in C. G. Jung's theory of the collective unconscious. These archetypes are closely connected to our impulse to try to understand and learn, as they form the foundations not only of the physical world but also of our mental and emotional worlds. Collectively these living symbols may also form the vibration from the "keynote of truth" struck millions of years ago into the mind of mankind by higher intelligent forces overseeing the early stages of human development, as mentioned in The Mahatma Letters to A. P. Sinnett. Theosophy holds that thoughts are entities with rudimentary intelligence which naturally reside within a vast mental repository, sometimes called the astral light, surrounding and interpenetrating our planet. As far as our physical, mental, and emotional growth is concerned, including language acquisition, we have karmic tendencies, individually and as a humanity, closely tied to attributes from former lives and influences within the astral light which determine general as well as more specialized strands of our development. The rapidity and rationale of our first language acquisition, therefore, may be an unconscious remembering or "downloading" of the language qualities we have learned as a species since the foundations of language were originally laid down within the astral light by the earliest humanity, all the way through to the grammar used by each of us in our last incarnation.